Contrary to popular belief, paid advertisement is not the only way to get more customers and increase business sales volume. 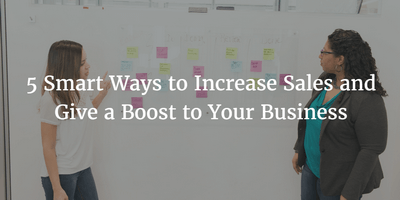 Regardless of your business type, whether it is a traditional business or an online retail store, your products and services, there are many smart ways to increase sales and give a boost to your business. Following are some ways to achieve your business goals without spending top dollars on marketing campaigns and advertisement. Approaching your existing customers is one of the most effective ways to boost your sales volume. And especially in case of online business, it is much easier, resource efficient and effective to approach people who already know your business and offer them more of your products and services. A well known example is Amazon’s “you may also like” message that appears below the item you are buying. Talking to your existing customers would also give you some insights about the reasons why your customers like a particular product or dislike a particular one. Of course this is an iterating process where you can improve your business gradually. Many businesses all over the globe are benefiting from this approach by offering their services and products in a bundle. For example, a web development company might offer web development and digital marketing services as a complete package. There are two main things you should consider before using this approach. First of all, the only incentive these bundles can offer is price reduction. So, if product A costs $100 and product B costs $50 then the combined package should be around $130-140. Secondly, it is preferable to offer those products and services individual as well as a bundle so people who are only interested in one of them can get things they want without feeling they are wasting money on things they don’t want. Offering promotional discounts and limited-time sale is a great way to get more customers. No doubt people love discounts and by reducing the price while increasing the sales volume you can keep things in check in terms of profit. However, the added benefit is lots of new customers who would refer your product and services to their friends and colleagues. You can also offer sale on particular items and those items would bring customers who would buy other products too, at normal price. Small businesses can benefit from social media in many ways. One of the biggest advantages of social media is its cost efficiency. You can use it for free to increase user engagement and you can use paid advertisements to target your customers based on their location, gender and other parameters. Social media networks like Facebook, Twitter and Etsy can help you increase sales and give a boost to your business. Bounce rate refers to the number of people leaving your website after visiting a single page. I wrote a detailed post on this matter few days ago and you can check it out from here. In a nutshell, you need to improve your website user experience to help your customers decide what they want to buy. A cluttered website with non-relevant information would simple repel visitors.